Old Bollywood pressbook of the Hindi film Dhanwan (1981) for sale. This is an actual surviving rare Bollywood old pressbook of the 1981 film that starred the original superstar of Indian cinema, Rajesh Khanna in the lead role. 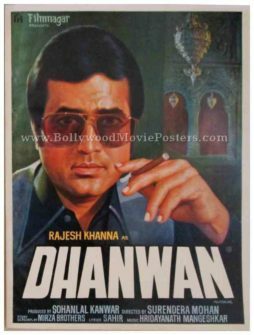 Printed and circulated during the original first release of Dhanwan in 1981, this rare Bollywood old pressbook was distributed to cinema audiences outside movie halls that actually screened the film. 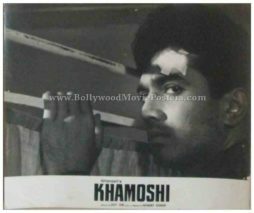 Black and white old Bollywood photo stills of the Hindi film, Khamoshi (1969) for sale. This is an actual surviving set comprising two old Bollywood lobby cards of the highly acclaimed 1969 Hindi film directed by Asit Sen, starring Rajesh Khanna and Waheeda Rehman in lead roles. Printed and circulated during the original first release of the film (late 1960s), this set of two old Bollywood black and white pictures was printed for publicity of the film inside a cinema hall but never ended up being used. 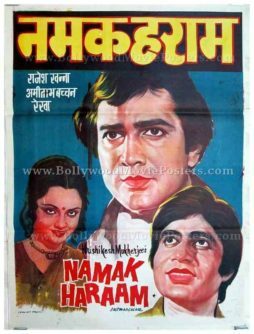 Quirky hand drawn old Bollywood poster of the hit Hindi film, Namak Haraam (1973) for sale. This is an actual surviving vintage poster of the 1973 film, which featured two of the biggest superstars of Bollywood, Rajesh Khanna & Amitabh Bachchan. 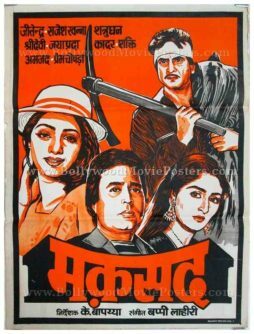 Printed and circulated somewhere in the late 1970s, this quirky, hand painted vintage Bollywood movie poster was originally designed for publicity of the film but never ended up being used. Rajesh Khanna, also referred to as the first or original superstar of Bollywood, went on to win the best actor award for his performance in the film. In total, Rajesh Khanna appeared in over 100 movies as lead hero – an unbeatable record in Bollywood. The presence of two Bollywood superstars (Rajesh Khanna and Amitabh Bachchan) together, makes this poster highly collectible. This poster was originally designed on a hand painted canvas by a small time art studio in Delhi, further increasing its collectible quotient. 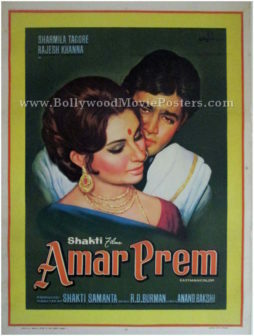 The poster features a large hand drawn portrait of superstar Rajesh Khanna. A portrait of Rekha is seen on the left, while a very quirky painting of Amitabh Bachchan appears at the bottom. Typography used in the poster is a combination of Devanagari Hindi on the top and English on the bottom. Namak Haraam (Traitor) is a 1973 Hindi film directed by Hrishikesh Mukherjee starring Rajesh Khanna and Amitabh Bachchan in lead roles. It also stars Rekha, Asrani, Raza Murad, A.K. Hangal, Simi Garewal and Om Shivpuri. For his performance in the film, Rajesh Khanna received the award for Best Actor (Hindi) in 1974. The film’s music was composed by R.D. Burman, and songs from Kishore Kumar picturized on Rajesh Khanna became popular hits. 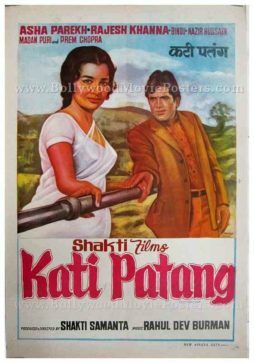 Beautiful hand painted old Bollywood poster of the hit Hindi film Kati Patang (1970) for sale. 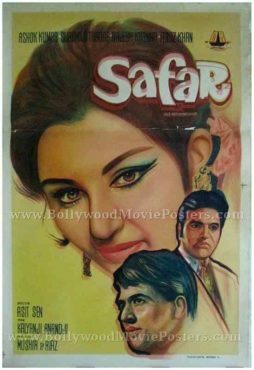 This is an actual surviving vintage poster of the 1970 film that featured Rajesh Khanna, known as the original (first) superstar of Indian cinema, in the lead role opposite Asha Parekh. 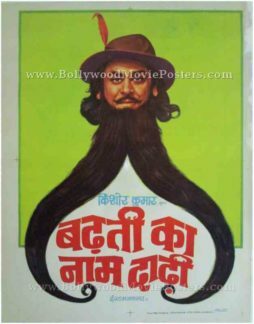 Printed and circulated somewhere during the release of the film, this hand painted old Bollywood movie poster was originally designed for publicity of the film but never ended up being used. This poster was originally designed on a hand painted canvas in single sheet size (40″x30″ inches), making it very collectable. The poster features a brilliant hand painted portrait of actress Asha Parekh dressed as a widow. Rajesh Khanna is seen holding her hand with a landscape painted in the background. 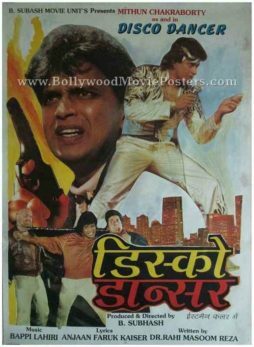 The typography used in this poster is primarily English along with a translation of the title in Devanagari Hindi. 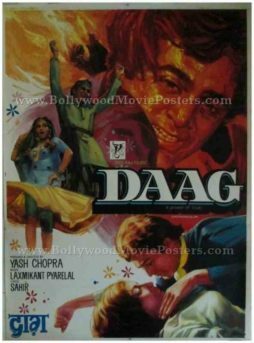 The film was the second in a string of hits in which Shakti Samanta and Rajesh Khanna successfully collaborated. The music of the film composed by Rahul Dev Burman became its highlight. One of the greatest singers in Bollywood, Kishore Kumar, sang four solos songs for Rajesh Khanna. 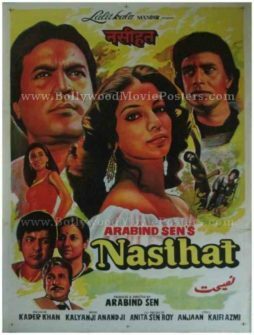 Asha Bhosle sang the first ever Hindi rap number, “Mera Naam Hai Shabnam” in this film. Songs from the film such as “Yeh Shaam Mastani,” “Yeh Jo Mohabbat Hai” and “Pyar Deewana Hota Hai” have become evergreen classics and played till today. 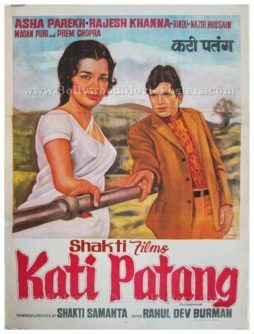 Beautiful hand painted old Hindi film poster of the hit Bollywood movie Kati Patang (1970) for sale. 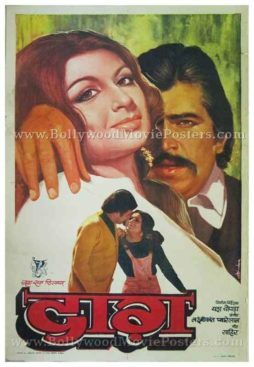 This is an actual surviving poster of the 1970 film that featured Rajesh Khanna, known as the original (first) superstar of Indian cinema, in the lead role opposite Asha Parekh. Printed and circulated somewhere during the release of the film, this hand painted vintage movie poster was originally designed for publicity of the film but never ended up being used. 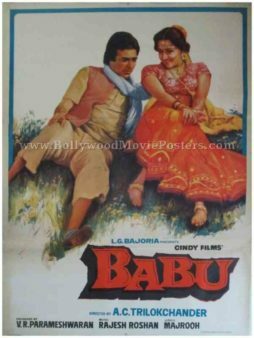 This old Hindi film poster was originally designed on a hand painted canvas in half sheet size (30″x20″ inches), making it very collectable.